Welcome aboard. We’re headed south by southwest from Florida’s Gold Coast to Mexico’s Mayan Coast, and then back by way of the Offshore Bank and the Conch Republic. 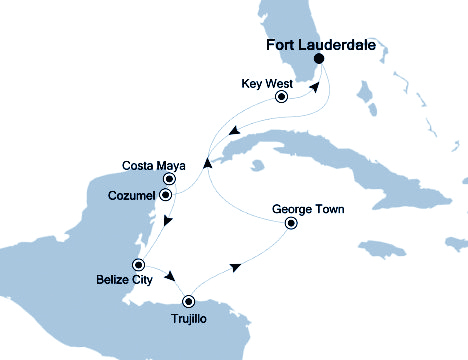 We depart Fort Lauderdale aboard Silversea’s handsome Silver Wind headed first for the Mexican resort of Cozumel along the dead end of the Gulf of Mexico. And then we make a visit at Costa Maya, another tourist playground, a small place with a large history in the ancient cultures of Mexico. From there we continue south along the Gulf Coast to the somewhat-less-visited port of Belize City in the somewhat-obscure nation of Belize (a former Imperial colony known as British Honduras until 1973). Belize is the only nation in Central America where the official language is English, albeit with a strong influence of Spanish and Creole. After then to the island of Roatan in the nation now known as Honduras, before then as Spanish Honduras. It also was known as the original “Banana Republic”, a not-complimentary nickname bestowed on the nation and the region by an American writer in 1904. We turn away from the coast to head to George Town, Grand Cayman–a most unlikely address for a large number of banks, accounting firms, lawyers, and multinational companies that come to worship the sun and very liberal taxation and regulatory schemes. There are some lovely beaches, too. And finally, we have ahead of us an overnight at the very quirky port of Key West in Florida, the southernmost point in the continental United States. Just about anything goes here, and in fact the place even tried to go away from the mother country, an effort memorialized by Conch Republic flags.